The first Cornish Gorsedh ceremony | Cornwall For Ever! The first Cornish Gorsedh ceremony was held in the Boscawen-Un stone circle in 1928. At the ceremony, people were rewarded for promoting Cornwall and its identity. These people became Bards (members) of the Cornish Gorsedh. A Gorsedh ceremony has been held in Cornwall every year since 1928, and over 1,000 people have become Bards. 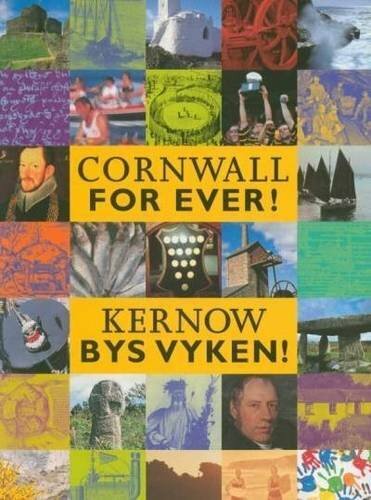 An kynsa solempnita Gorsedh Kernow a veu synsys 1928 yn kylgh a veyn Bosskawen Woon. Y’n solempnita, pewasow a veu res dhe dus drefen avonsya Kernow ha’y honanieth. An dus ma eth ha bos Berdh (eseli) Gorsedh Kernow. Solempnita a’n Orsedh re beu synsys yn Kernow pub bledhen a-dhia 1928, ha moy ages 1,000 person res eth ha bos Berdh. A Gorsedh is group of people who have worked hard to promote the identity of their nation. This might be through literature, music, poetry, sport or learning a Celtic language. These people are invited to become Bards of the Gorsedh. A Gorsedh was set up in Wales in 1792 and in Brittany in 1900. The people and languages of Wales, Brittany and Cornwall are closely connected. The Cornish Gorsedh was set up by Henry Jenner and Robert Morton Nance. Henry had worked very hard to promote Cornwall’s Celtic identity and the Cornish language. He and other people asked the Gorsedh of Wales to help set up a Gorsedh for Cornwall. So, in 1928, a small group of Cornish people attended the Gorsedh ceremony in Wales and became Bards. The Cornish people who had become Bards in Wales organised the first Gorsedh ceremony for Cornwall. It was held on Friday 21st September at the Boscawen-Un stone circle near Penzance. Penzance Silver Band led the procession of Bards from Boscawen Farm into the stone circle. Henry was made the first Grand Bard (leader) of the Cornish Gorsedh and 12 other people became the first Cornish Bards. Bards from Wales attended the ceremony, along with members of the Federation of Old Cornwall Societies and the mayors of towns in Cornwall. The Cornish, Welsh and English languages were spoken at the ceremony and the song ‘Bro Goth Agan Tasow’ (Old Land of My Fathers) was sung, which is a national anthem for Cornwall, Wales and Brittany. Since 1928, a Gorsedh ceremony has been held every year at a different location in Cornwall. Over 1,000 people have become Bards since 1928, including people from Australia and the USA. Many of these people have done important things to help protect Cornish culture, history, music and language. People who have become Bards recently include surfer Tassy Swallow in 2013, and Ed Rowe (Kernow King) in 2015. When people become a Bard they choose a special Bardic name. The name is usually in the Cornish language. Tassy Swallow’s Bardic name is Morvoren Mordonnow, which means Mermaid of the Sea Waves. Ed Rowe’s Bardic name is Mab Tregarrek, which means Son of Roche. The Cornish Gorsedh has nothing to do with druids or paganism. The Gorsedh is not a religious or political organisation, and you do not have to be born in Cornwall to become a Bard.